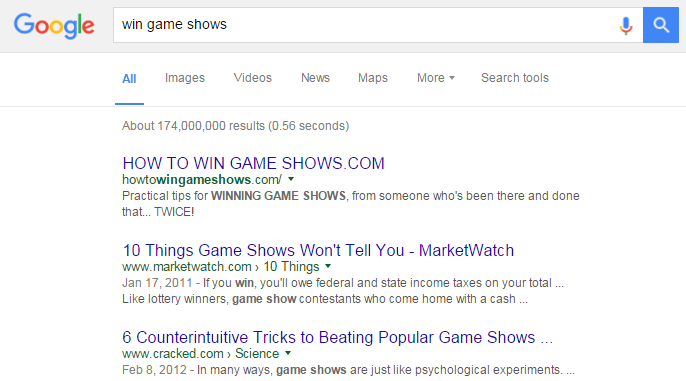 2½ YEARS OF GAME SHOW WINNING TIPS, STRAIGHT FROM THE INSIDERS! DO YOU DREAM OF WINNING A GAME SHOW? The Fun? The Fame? The CASH and fabulous prizes? Two-time game show champion Stephen Hall has been running the blog HowToWinGameShows.com since March 2013. That’s where he’s shared all the secrets from his own game show winning journey, which saw him take home $672,357 in cash and prizes, and earn the official title of Australia’s Brainiest Quizmaster. Stephen’s also interviewed game show winners, game show hosts, game show producers and game show question writers… in an ongoing search for the very best Practical Game Show Winning Tips in the World. Now, for the very first time, all the best tips, hints and strategies from over 2 years of articles, essays and interviews have all been compiled into one handy volume. Stephen shares the tips, hints and strategies he used in winning Australia’s Brainiest Quizmaster, and in completing his seven night winning streak on Temptation, which netted him $672,357 worth of cash and prizes! Not just one, but TWO MILLION-DOLLAR WINNERS from Who Wants To Be A Millionaire? And other GAME SHOW CHAMPIONS, who, between them, have won OVER TWO MILLION DOLLARS’ worth of cash and prizes! For the first time, all together in one place – all the winning tips and hints from the people who make your favourite game shows… And from the people who win them! This eBook could save you months of trial and error, learning lessons the hard way, and potential audition rejections. It will give you distinct, measurable advantages that other aspiring game show contestants just won’t have. But you can. With How To Win Game Shows: The eBook, you can. With a little help from this eBook, you will have the edge. You will have done your homework. You will be a serious game show contender, you will be a force to be reckoned with. a combined total of over FOUR MILLION DOLLARS worth of cash and prizes won. So, here comes the clichéd question… How much would you expect to pay? So what are you waiting for? To purchase ‘How To Win Game Shows: the eBook’ right now, for just $4.99 AUD… simply click on the button below! If you’re in the US, it’s also available at amazon.com, and if you’re in the UK, you can find it at amazon.co.uk! what great timing you have!! Reminds me of a time back in 1993 when I was at RMIT, in the Student Radio studio sobbing because of something some boy had done, and there you were, telling me he wasn’t worth it and I shouldn’t worry about someone like him. You saved me that day! I’m shortlisted for The Chase so this may well be another helping hand from you! Wow – thanks very much, Gina; what a lovely message. I hadn’t thought about those RMIT radio days for ages. What a blast from the past! Thanks for your purchase, and I hope the eBook gives you a few useful pointers for your upcoming appearance on ‘The Chase’. Now go get ’em!